Looking for collaborative workspace a little different from the traditional? This downtown Detroit creative space is spread over seven floors and provides a great mix of private offices, co-working space, spacious and technologically equipped conference rooms, comfortable lounge areas and much more available for professional occupants. Modern decor mixes perfectly with original historic details to create a vibrant working environment. 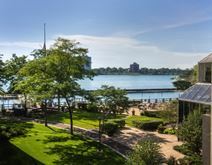 Set in an iconic Detroit location on the riverfront this center provides great access to the entire city and major automotive giants, restaurants, retailers and coffee shops on your doorstep. This contemporary, professional and highly impressive co-working space is spread across the whole 2nd floor of this large landmark office building with larger rooms on the 3rd and 4th floors. Prospective tenants and corporate occupants have the option to choose a floating desk for ultimate flexibility or a dedicated desk space based upon their specific individual business requirements and specifications. Fruit infused water for members and their guests all day every day is just one of the little touches that make taking space at this location the right choice for your business. The on-site team do everything they can to make you feel welcome and support your business. The beautiful glass building is in the heart of Downtown Detroit and offers a mix of hot-desking and private office options.